A wallet-friendly mic option that's ideal for capturing on-the-fly demos. Flexible positioning. Cabling avoids laptop noise. Compact and portable. Won't stand-up past the demo stage. 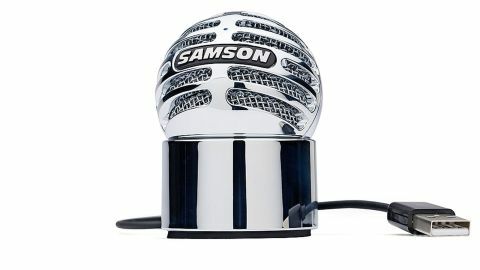 Samson has released a new smaller version of its Meteor condenser microphone, the Meteorite. And it would seem it's managed to encapsulate the same recording quality and specs into this new diminutive form. "The inclusion of the USB cable prevents it picking up too much laptop noise"
The Meteorite is primarily focused on the Skype/Facetime/VoIP market, but is also more than capable of capturing quick ideas on the fly. The inclusion of the USB cable prevents it picking up too much laptop noise and the capsule can be tilted and swivelled in its magnetic base. Also worth bearing in mind, if you're looking for an ultra-portable solution to replacing your laptop's in-built mic, is Samson's recently-released Go Mic Direct. It attaches directly to the USB port but can pick up noise, especially if it is close to the fan port.